The property is situated on a ridge, with a commanding view to the west, one hour from Washington DC in Montgomery County (with its excellent schools). The 6000 sq. ft. house, which was built in 1998 on a 5 acre lot, has four bedrooms 4 ½ baths and a 4-car garage. On the ground floor are the kitchen, dining room, large family room (with fieldstone fireplace), study, and music room. The partially-finished walk-out basement includes the ham shack, another family room (with wood-burning stove), workshop, sauna, one of the bathrooms and a storage area. At the rear is a large wood deck There is a 10 kW solar array on the back of the house, and a barn that houses tractors (3), and other yard maintenance equipment. A 15-foot mast atop an 80 ft. Rohn SSTV tower supports (at the top) a shorty-forty, below which is an 8-element beam for 10 meters, and then a 6-element for twenty. 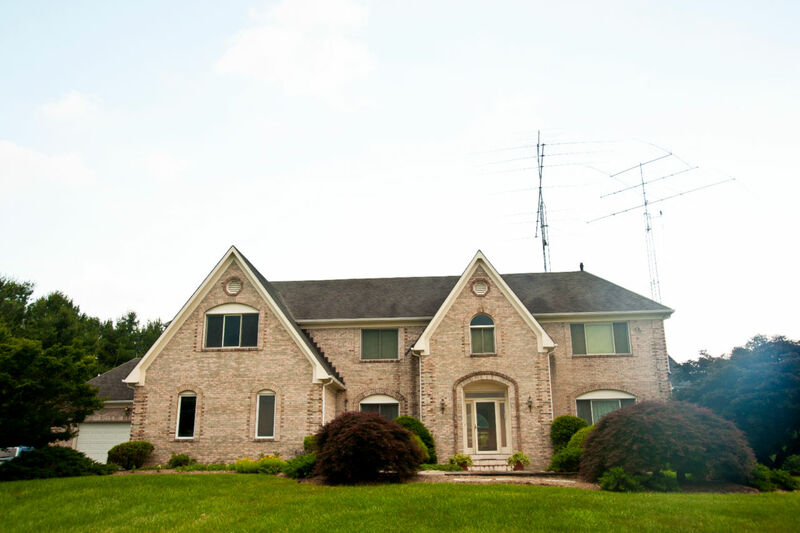 A Rohn 25, tower bracketed to the house brick chimney, carries (at 60 feet) a 7-element 15- meter beam. A second Rohn 25 tower, at the rear of the lot, supports one end of a rectangular loop for 160 meters. There are inverted-V antennas for 80-meters (CW and phone) and a 40-meters (broadband). The shack contains a pair of Yaesu FT 1000MPs (upgraded with roofing filters), Emtron DX-2sp amplifiers, Palstar tuners etc., and is located the farthest from the rest of the house, with its own walkout exit to a patio area beneath the deck..